DIE Lunæ, 12 die Novembris. Jeffes' Suit. against his Tenants, stayed. Order to prevent Stoppages in the Streets leading to the Parliament House. Commons Message, about examining Accompts referred to a Committee. Jackman, who arrested Spurrier his Servant, released. Pritchard and Gwyn to be attached, for Non-payment of their Fees. Upon the Petition of Thomas Earl of Cleveland, a Member of this House; complaining, "That, contrary to the Privilege of Parliament, there is a Suit now prosecuted against him, in the Court of Exchequer, in Mr. Attorney General's Name, but at the Relation of one John Jeffes, against several Persons and Tenants of his Lordship in the Manors of Stepney and Hackney, to his great Damage:"
It is ORDERED, by the Lords Spiritual and Temporal in Parliament assembled, That there be no further Proceedings in this Suit, in the Court of Exchequer, during the Time of the Privilege of Parliament: And hereof all Parties concerned are to take Notice, and observe the same accordingly. Whereas there hath been of late much Interruption, by Carts and Drays, in King-street, in the City of Westm. so that the Lords and others are frequently hindered from coming to Parliament, to the Disservice of the King and Kingdom, and the Hinderance of the Members of Parliament: It is therefore ORDERED, by the Lords Spiritual and Temporal in Parliament assembled, That the Steward of the City of Westm. or his Deputy, together with the Justices of Peace of the said City, shall, by their Care and Directions to the Constables within the said Limits, take special Order, that no Cart or Dray make any Stay, more than for disburdening its Carriage; and that no empty Hackney Coach be suffered to make any Stay, between Whitehall and The Old Pallace, Westm. aforesaid, from Nine of the Clock in the Morning to One in the Afternoon, during all the Sitting of this Parliament; and that no unnecessary Carriages by Carts or Drays be permitted to go through the said Streets, between the Hours aforesaid, during the Sitting of both Houses of Parliament: And herein a special Care is to be taken by the said Justices and the Constables, as the contrary will be answered to this House. The Lord Privy Seal reported, "That the Committee of the whole House have considered the Bill against importing of Irish Cattle, &c.; wherein the Committee have made some Alterations, which are offered to the Consideration of the House." In the 9th Line, to leave out the Word ["altogether"]. In the 19th Line, instead of the Word ["Nuisance"], to put in the Words ["Detriment and Mischief"]. After some Debate hereof, the Question being put, "Whether to concur with the Committee in this Alteration?" In the 25 Line, to leave out the Proviso for Scotland, beginning with the Word ["Provided"], unto the Word ["this"] in the 28th Line. ORDERED, That this House will proceed in this Report To-morrow. 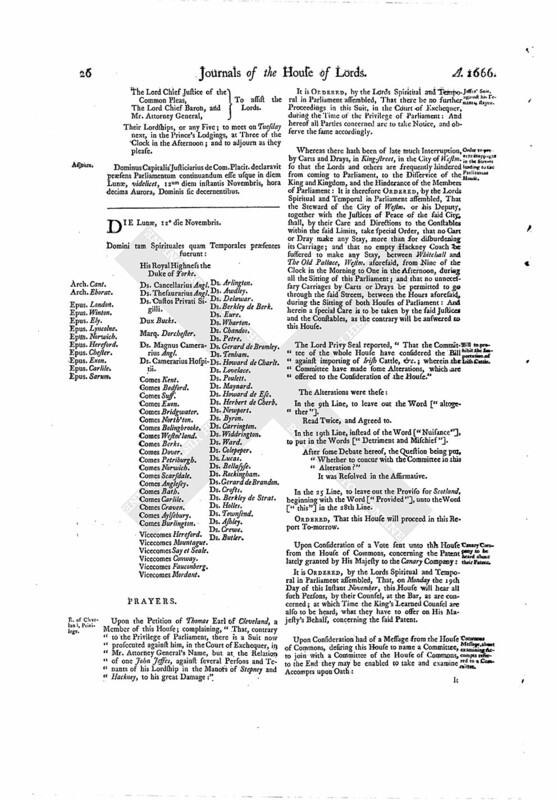 It is ORDERED, by the Lords Spiritual and Temporal in Parliament assembled, That, on Monday the 19th Day of this Instant November, this House will hear all such Persons, by their Counsel, at the Bar, as are concerned; at which Time the King's Learned Counsel are also to be heard, what they have to offer on His Majesty's Behalf, concerning the said Patent. It is ORDERED, by the Lords Spiritual and Temporal in Parliament assembled, That it be referred to the Lords Committees appointed to take Consideration of the Customs and Orders of the House, and Privileges of the Peers of this Kingdom and Lords of Parliament, to consider of Precedents, what hath been done formerly in Business of the like Nature; and to make Report unto this House. 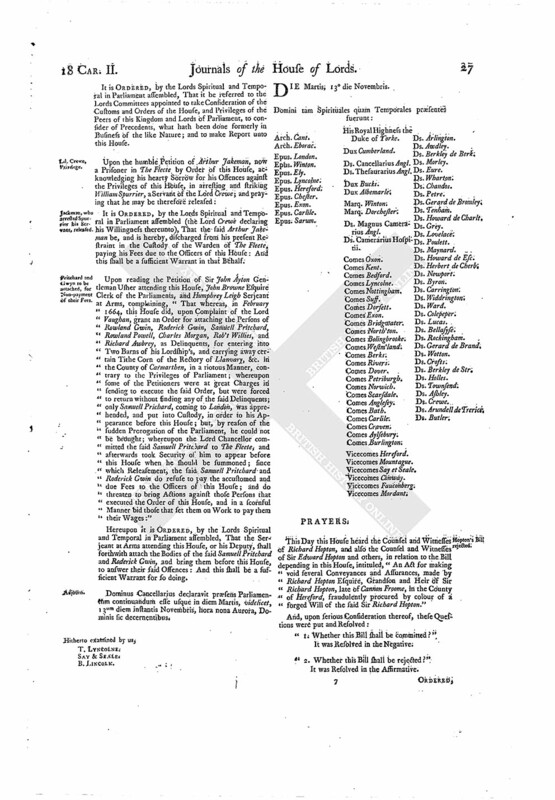 It is ORDERED, by the Lords Spiritual and Temporal in Parliament assembled (the Lord Crewe declaring his Willingness thereunto), That the said Arthur Jakeman be, and is hereby, discharged from his present Restraint in the Custody of the Warden of The Fleete, paying his Fees due to the Officers of this House: And this shall be a sufficient Warrant in that Behalf. Upon reading the Petition of Sir John Ayton Gentleman Usher attending this House, John Browne Esquire Clerk of the Parliaments, and Humphrey Leigh Serjeant at Arms, complaining, "That whereas, in February 1664, this House did, upon Complaint of the Lord Vaughan, grant an Order for attaching the Persons of Rowland Gwin, Roderick Gwin, Samuell Pritchard, Rowland Powell, Charles Morgan, Rob't Willies, and Richard Awbrey, as Delinquents, for entering into Two Barns of his Lordship's, and carrying away certain Tithe Corn of the Rectory of Llanvary, &c. in the County of Carmarthen, in a riotous Manner, contrary to the Privileges of Parliament; whereupon some of the Petitioners were at great Charges in sending to execute the said Order, but were forced to return without finding any of the said Delinquents; only Samuell Prichard, coming to London, was apprehended, and put into Custody, in order to his Appearance before this House; but, by reason of the sudden Prorogation of the Parliament, he could not be brought; whereupon the Lord Chancellor committed the said Samuell Pritchard to The Fleete, and afterwards took Security of him to appear before this House when he should be summoned; since which Releasement, the said Samuell Pritchard and Roderick Gwin do refuse to pay the accustomed and due Fees to the Officers of this House; and do threaten to bring Actions against those Persons that executed the Order of this House, and in a scornful Manner bid those that set them on Work to pay them their Wages:"
Hereupon it is ORDERED, by the Lords Spiritual and Temporal in Parliament assembled, That the Serjeant at Arms attending this House, or his Deputy, shall forthwith attach the Bodies of the said Samuell Pritchard and Roderick Gwin, and bring them before this House, to answer their said Offences: And this shall be a sufficient Warrant for so doing. Dominus Cancellarius declaravit præsens Parliamentum continuandum esse usque in diem Martis, videlicet, 13um diem instantis Novembris, hora nona Aurora, Dominis sic decernentibus.